This polymer-covered sugar spoon with its cautionary warning caught my eye at breakfast. Judy Belcher explained that when Leslie Blackford was a house guest, she stirred her morning coffee with the sugar spoon and returned it to the sugar bowl…in violation of house rules. Judy’s husband brought the breach of etiquette to Leslie’s attention. To atone for her gaffe, Leslie sent the Belchers a special spoon immortalizing the occasion so that others wouldn’t make the same mistake. It’s a charming, funny story and it certainly is effective. Do you have polymer art that tells a tale or makes you smile? That can be one of the best uses of our art. More silly stories from the road on Monday. Have a great weekend and mind your manners. 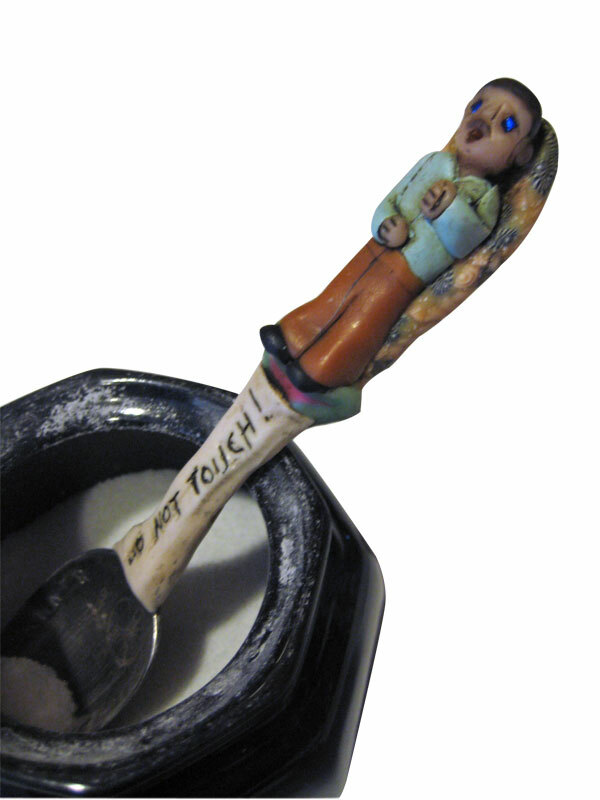 Cute spoon, and I suddenly see a whole new direction for my clay. How about “I thought I was wrong once, but I was wrong?” or “Stressed is Desserts spelled backwards?” I could stir my coffee with those every morning. That is, if I drank coffee. Yes, we all have our house rules, but where guests are concerned, lighten up!! What a humorous and perfect gift that will stand as a fun and mute reminder to future guests. Was the so called “breached spoon” covered with polymer clay? Cuz if so, the breach of etiquette went to the wrong person! I’m sure Judy and her husband were just having some fun with Leslie :o) …and that is just like Leslie…to gift someone with a piece of her amazing art. I should know, I was the recipient of one of her “Carnies” at last year’s Acre Show (same day that I swiped one of Judy’s cool poker chips). Leslie is amazing in her creativity. Awesome spoon! I always had a different shaped spoon for the sugar bowl until it went missing. One would know that spoon from any other. I started using liquid Agave instead of sugar, so now I ‘squeeze’, lol. Would be a great gift tho. Different culture, different habits – it’s all part of the fabric of life. Some cultures pour milk from the bottle, others are horrified a jug is not used. Some want milk in the cup before tea or coffee, others after, some are horrified being served warm beverages in mugs and not cups. In some cultured one has to finish what’s served on a plate, in others it’s impolite to do so. Imagine giving a polymer clay gift and the recipient thanking you and not unpacking it in front of you, but waiting until you have departed again. It would be horrible not to see their face. What an awesome story with a sweet ending! I need to make some og theose sugar spoons. My husbands family are notorious “double dippers”!!!! Love the spoon. It’s fun to have friends with a sense of humor. Love the spoon! Leslie’s creativity knows no bounds. I’m sure Judy and her husband got a big kick out of it.